However, I recently made a pulled pork recipe from a new cookbook, and while it didn’t call for tortillas, I thought that not only would they be a great excuse to try making them from scratch, but that they’d be a great addition to the recipe. And they were! These are ridiculously easy to make, with ingredients you probably already have on hand. I adapted the recipe and techniques from here and here. The recipe below makes one dozen 6” tortillas. Whisk the flour, salt, and baking powder together in a medium mixing bowl. Mix in the shortening with your hands and fingers until evenly dispersed throughout the flour. Add the water and mix with your hands until the dough comes together; knead it a few minutes right in the bowl or place dough on a lightly floured surface to knead; knead until dough is smooth and elastic. Divide the dough into fourths, then divide each fourth into three equal pieces; roll each piece into a ball about the size of a ping pong ball or golf ball. 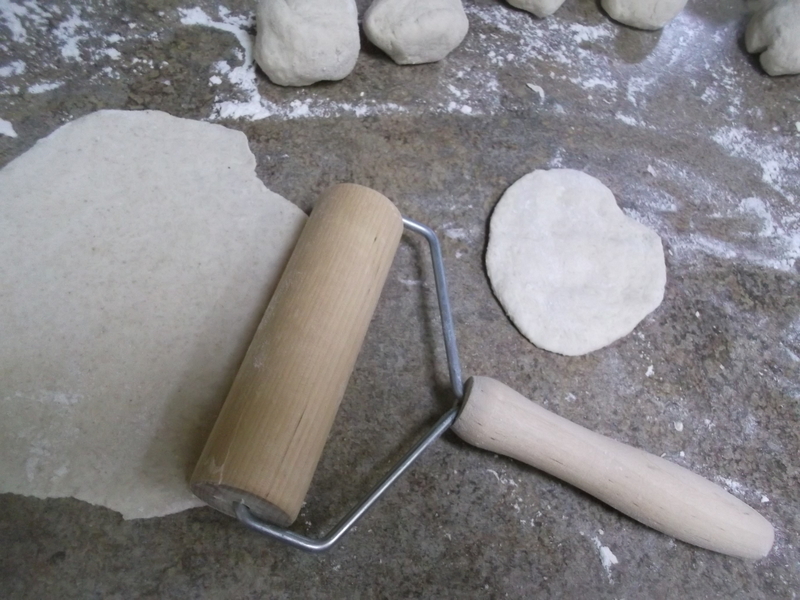 Keeping the work surface and rolling pin lightly floured, flatten each dough ball by hand and then roll into a thin, round tortilla about 6-7 inches in diameter. Set rolled tortillas aside, but they may become soggy if stacked directly on top of each other. Preheat a large griddle or pan over medium-high heat until hot enough that water droplets sizzle, bead up and roll around. 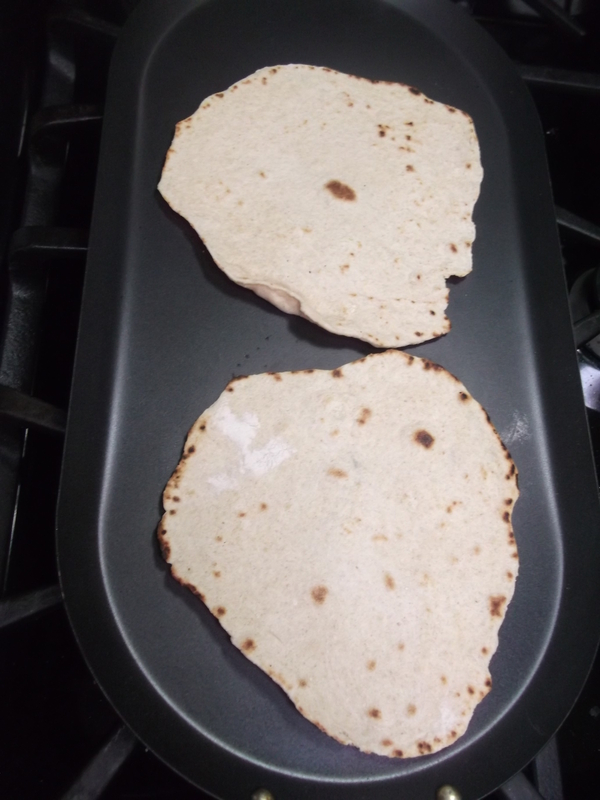 Place tortillas on the hot griddle/pan and cook about a minute or so, until a few bubbles start to form and the underside has a few golden spots. If the spots are black, reduce the heat a bit. Flip and cook for another 30 seconds, then remove; stack cooked tortillas on a plate until all are done. Wipe out excess flour or any burnt bits between batches. Serve tortillas warm or allow them to cool if using later. 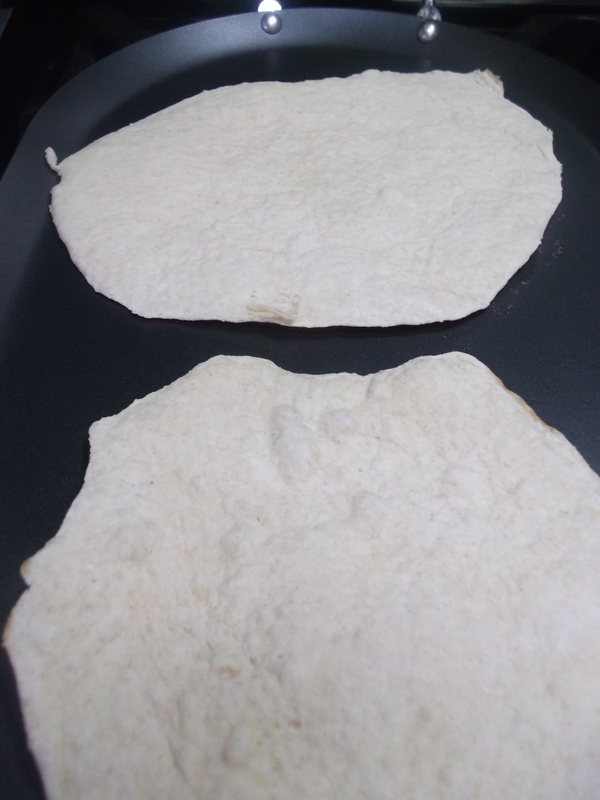 Store tortillas in an airtight container or resealable plastic bag at room temperature for 24 hours, in the refrigerator for up to a week, or in the freezer – wrapped very well – indefinitely. 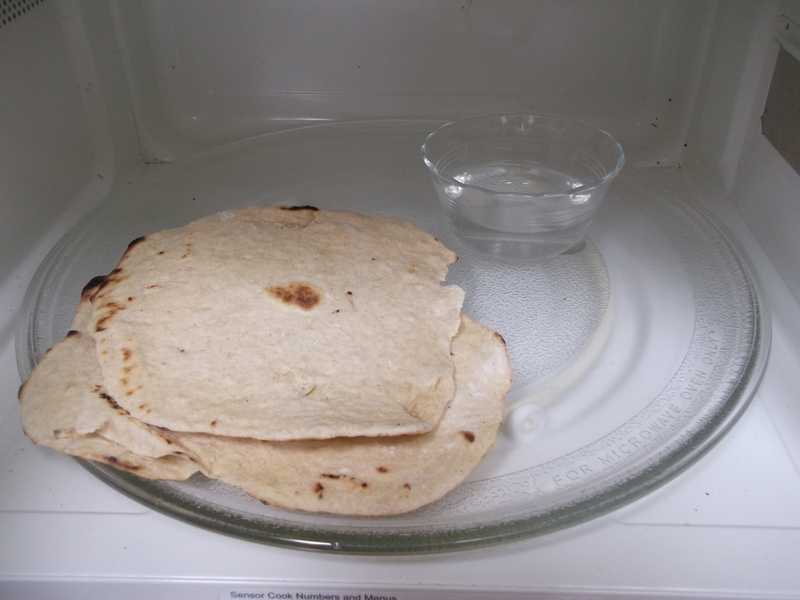 Tip: To warm them in the microwave, place stacked tortillas in the microwave with a small bowl of water. Heat on high for 15 to 25 seconds or until warm, then cover to keep warm. The water will steam them just enough to prevent them from drying out; remove the water carefully as it may be very hot. Whisk the dry ingredients together and then user your fingers to mix in the shortening – you will be able to tell it’s mixed in when all the flour looks uniform in size/texture, with no more big chunks. It’ll make sense once you do it – I couldn’t get a good photo. Add the water and mix with your hands until the dough comes together. It will be about the size of a large grapefruit. Knead it a few minutes until dough is smooth and elastic. 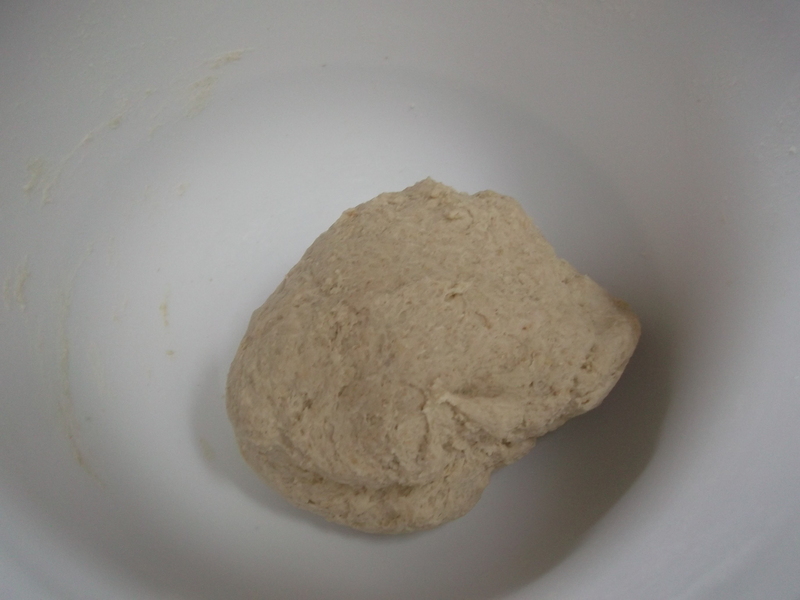 I just kneaded it in the bowl until it firmed up a bit, but you can do it on a floured surface as well. 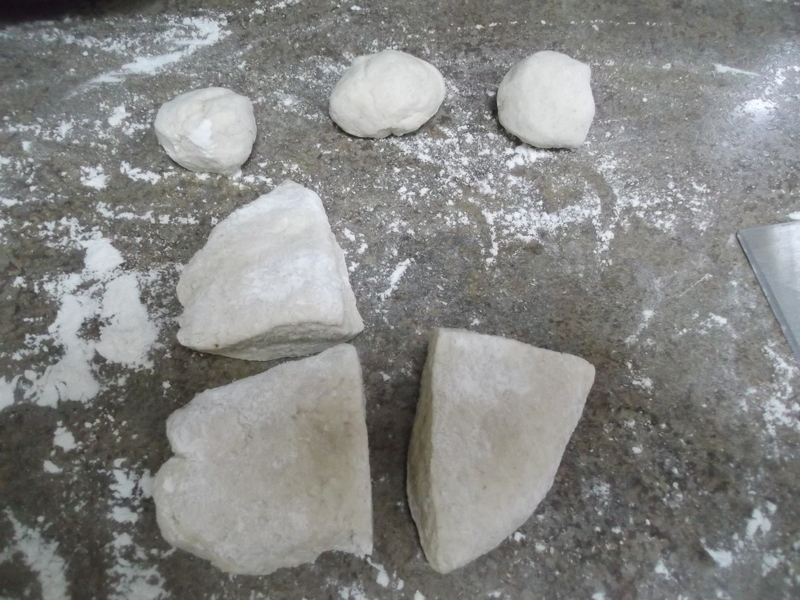 Divide the dough into fourths, then divide each fourth into three equal pieces; roll each piece into a ball about the size of a ping pong ball or golf ball. Or, if you’re like me, a few of each. Estimating “equal” size is apparently not my strong suit. 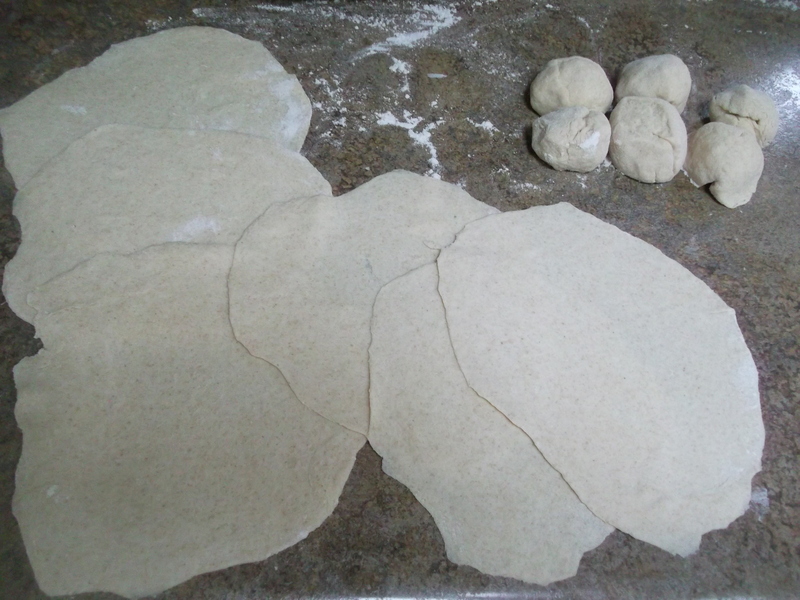 Keeping the work surface and rolling pin lightly floured, flatten each dough ball by hand and then roll into a thin, round tortilla about 6-7 inches in diameter. I start in the center and roll outwards in all directions, and when I’m lucky, I get a mostly round shape. Set rolled tortillas aside, but they may become soggy if stacked directly on top of each other for too long. I overlapped mine for about 10 minutes, though, and they were just fine. Preheat a large griddle or pan over medium-high heat until hot enough that water droplets sizzle, bead up and roll around. Have fun with that for a minute, then get back to the task. Place tortillas on the hot griddle/pan and cook about a minute or so, until a few bubbles start to form. Check the underside, and when it has a few golden spots, flip the tortilla. If the spots are black, reduce the heat a bit. Cook the other side for about 30 seconds, then remove. 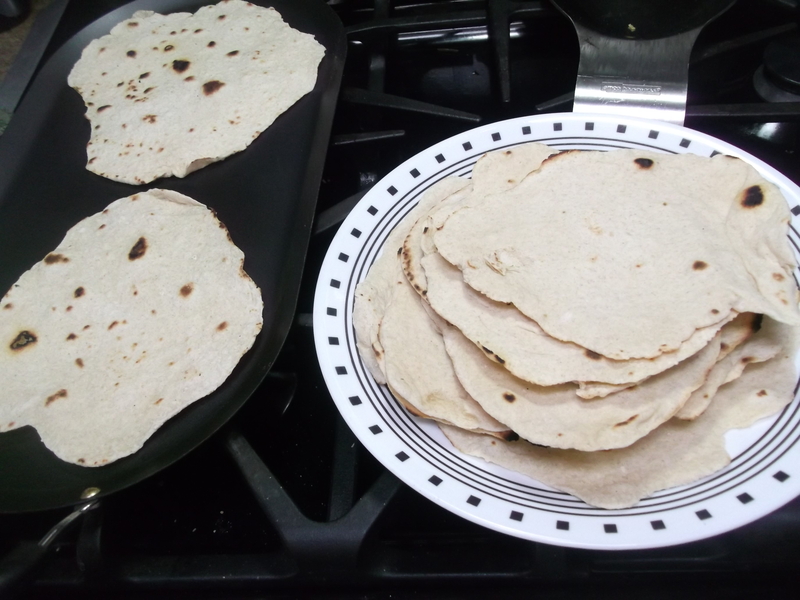 Wipe out excess flour or any burnt bits between batches or they will continue burning and scorching future tortillas. Stack cooked tortillas on a plate until all are done. Serve tortillas warm or allow them to cool if using later. Store tortillas in an airtight container or resealable plastic bag at room temperature for 24 hours, in the refrigerator for up to a week, or in the freezer – wrapped very well – indefinitely. Enjoy! Tip: To warm them in the microwave, place stacked tortillas in the microwave with a small bowl of water. Heat on high for 15 to 25 seconds or until warm, then cover to keep warm. The water will steam them just enough to prevent them from drying out; remove the water carefully as it may be very hot.